This post contains affiliate links. This means that if you click on the link and decide to make a purchase, I may receive a small commission to put towards keeping the blog going and creating more free recipes for you all. The price you pay stays the same. New to AIP? Want to know where to start? Unfortunately, there's a lot of conflicting information out there on what AIP actually is. And to make it even more complicated, there are different versions of AIP, depending on who you talk to. The AIP that I followed and it helped heal my psoriasis patches (25 years of psoriasis healed in just over a year with AIP - incredible!) is the one presented by Sarah Ballantyne, The Paleo Mom. 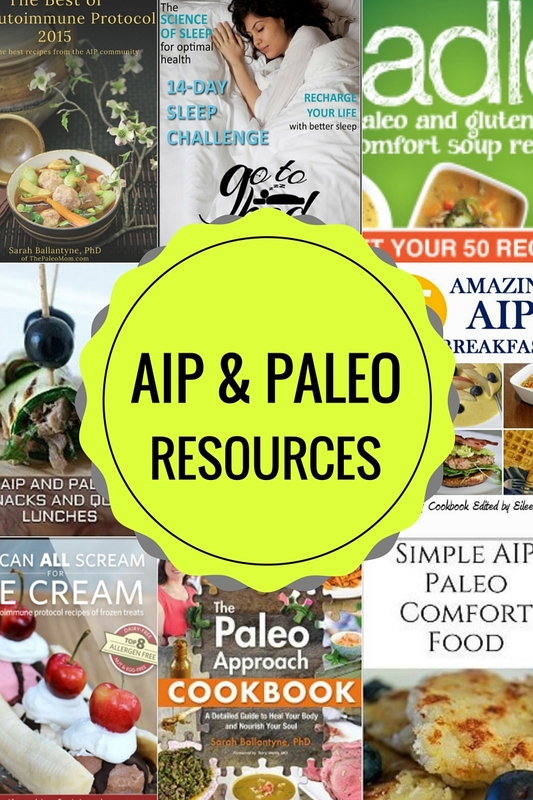 Sarah has an 'AIP-certified' list of blogs that adhere to the autoimmune protocol as set out in her book The Paleo Approach, so you'll be safe in the knowledge that all these bloggers are singing from the same sheet, so to speak. You'll find bloggers in the list that have or are healing autoimmune diseases like Crohn's, Rheumatoid Arthritis, Psoriasis, Psoriatic Arthritis and more. Check out the Paleo Mom Approved AIP Blogger's List. The great thing about ebooks is that they're instant. You don't have to start waiting for them to arrive in the post, and they're often cheaper than actual books, too. You can download them in seconds, meaning that you can get cooking straight away. 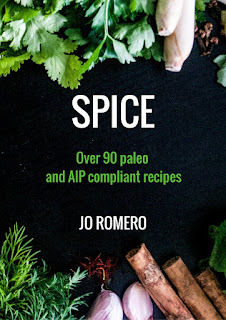 A collection of over 90 recipes that use AIP compliant herbs and spices to create a wide variety of dishes, including some takeaway favourites that you can now enjoy on AIP - such as Lamb Dopiaza (with no tomatoes or nightshade/seed spices! ), Lemon Chicken, Naan Breads and more. Cooked from SPICE? Then share on Instagram, Facebook or Twitter with the hashtag #AIPSpice and I'll share any I see. Italian inspired AIP recipes, such as ravioli, lasagne, butter cookies and pizza. AIP compliant recipes inspired by European and typically French cooking. Read my review of the book here. Available in paper copy as well as ebook format. 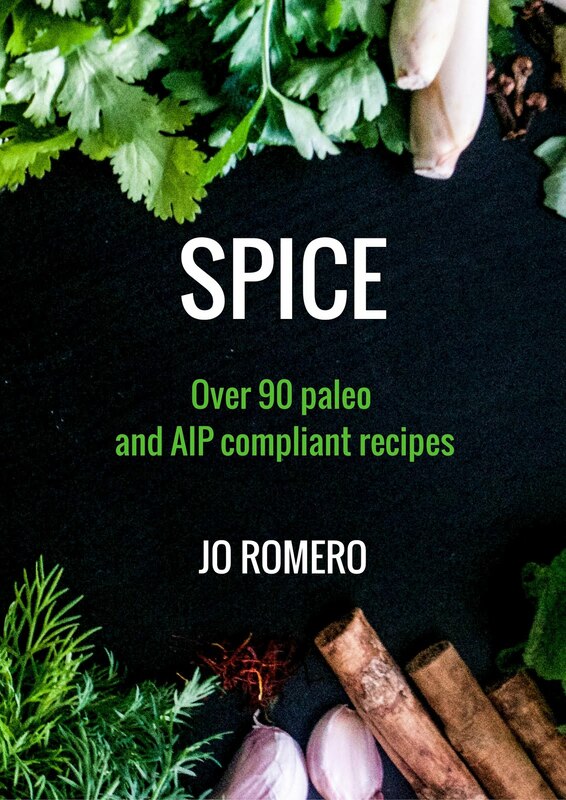 My first ebook, with over 40 AIP-compliant recipes. A focus on comfort food, there's roasts, quick dishes and stews as well as some of my favourite desserts. I wanted to emphasise how easy and simple AIP cooking can be, so most of the ingredients can be found easily and the dishes are fuss-free. Quick snacks, soups, salads - this will help if you're after quick meals to keep you going on AIP. The cookbook that accompanies The Paleo Approach, the book Sarah wrote to explain the hows, whys and the science behind AIP. Read my review here. I contributed recipes to this ebook, along with many other AIP bloggers, which is edited by Eileen Laird of the blog Phoenix Helix - 85 breakfast recipes, all totally AIP. Pancakes, soups, stir-fries... It's often said that people find breakfast the most difficult meal of the day at first, and this will definitely help. Want to see a sneak recipe from the book? Click here! Strict AIP isn't for forever. Here, Eileen helps guide you through when to reintroduce foods and which ones to choose when. There are also some gorgeous recipes in there, including home made chocolates, which I've made and are luscious. Here's my review of the book. The first AIP cookbook I owned, it helped me be a lot more creative in the kitchen in my early days of AIP. See me talking about the book in my You Tube video here. Incredible recipes from Angie Alt of Autoimmune Paleo. I loved the scallops and bacon kebabs and the pork and Brussell's Sprout stir-fry. Check out my review of the book here. And you thought AIP cupcakes couldn't be done - here Bre'anna shows you how to make cakes, pies, crumbles and other comfort foods. I dip into this book quite often for inspiration. Read my review of the book, and get your sneak preview recipe for 'chocolate'-filled strawberries (heck yes) here. If you haven't made Tara's roast duck, you're missing out. It's lovely, I've cooked it myself. The ice cream recipe is also gorgeous. Lots of inspiration packed in this ebook. Read my review here. Bre'anna has this incredible ebook with recipes to get you through the festive season. Rachael, the blogger over at Meatified has created a book of AIP recipes - one of my favourites is the tangy BBQ ribs. Go get it on Amazon as a paper book or ebook format. Sarah and Alaena, who blogs at Grazed and Enthused, team up for a beautiful collection of AIP recipes - desserts, pizzas, stromboli, breakfast hash... one of my favourite AIP books. With ideas on how to cook and serve those nutritious organ meats. I love this ebook. AIP-compliant, dairy-free dessert recipes - pancakes, banana splits, ice cream... perfect for those special occasions where you need a little treat. Holiday recipes including Cranberry Cake with Orange Honey Sauce and Orange Spice Panna Cotta - both AIP and Paleo recipes which is great for when you move on with reintroductions after strict AIP. An exercise, diet and lifestyle plan for those with autoimmune disease, developed by Andrea Wool. Did you know how important sleep is for your healing? Sarah Ballantyne has developed this plan to help you understand how sleep plays a role in your healing as well as help you get more and better quality sleep. Get coaching for 6 weeks of AIP from the experts! Work with Sarah's team of AIP experts to help keep you on track. Love yoga? Check out this yoga program that you can do from the comfort of your own home - with no need to go out to the yoga studio. I tried the programme out myself - read my review here. Want to save time on AIP? Fed up with spending an hour or two every mealtime chopping veg, prepping and cooking? Mickey Trescott has the answer - a program complete with shopping lists, meal plans and instructions and tips on batch cooking to make your life much easier. Read my review here. Get Sauced! - Kristen Boehmer - 33 sauce recipes, many can be made nut, egg, coconut and nightshade free. Hi, I'm trying to find a way to contact you through your website. Can you please share your email or link to contact form? Thanks. Hello Sarah - click on the About Comfort Bites link above in the header and you'll see my contact details there. Thanks!